Mark this down, I have a sick child AGAIN! This morning she wakes before 6AM, so Mommy had to too. What's wrong with this? Well, I have some large cookie orders to get done this week and I have my "work" time strategically planned out. My plan has the first couple hours of the morning as all mine, coffee, and cookies. Day number 2 that MY plan was thrown a wrench. At 7:30AM after, oh, about an hour of listening to her whine and cry through snot covered lips I look at her and say "Do you want to cuddle with Mommy on the couch?" To which she proclaims YES with a snot filled grin. So, I take a deep breath, look back at my kitchen in disarray and I hold her on the couch. 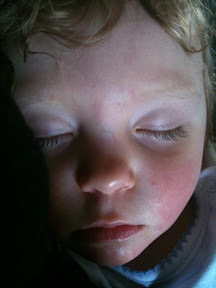 She feel asleep in my arms and every once in a while I felt her hand tighten as to feel to make sure I was still there. My Mommy G_d moment happened. As I sat there with no TV, no radio, no cookies being completed, no iPhone planner in front of me, and no audio book playing in my ears I had my epiphany. We spend our lives looking for love, giving love, wanting love, defining love, but as I held my sick baby in my arms fulfilling her need for comforting love I realized that I as Mommy G_d am Love. That's right, I said I AM LOVE! At that moment the only thing I was responsible for was BEING LOVE. I can honestly say this was the first time I ever felt this but now I understand the bible verse that states "God is Love". Being Love is so much greater and powerful than giving or receiving love. I'd recommend it for everyone. Oh, and after a couple hours she woke up happy--her love bag full--and I finished my cookie orders with time enough to jot this down.